Another installment of the Halloween franchise comes along right in time for the end of October and we line up to pay our respects, despite the fact that the series died long ago and that, if you look at it with a critical, non-nostalgic eye, the original wasn’t any good in the first place. Michael Myers, Laurie Strode, and Haddonfield will forever live in the annals of film history for what they gave to the horror genre, but their importance should have stayed in the past with their release, because every followup since has been a disappointment and a reminder that the franchise is weak to begin with. 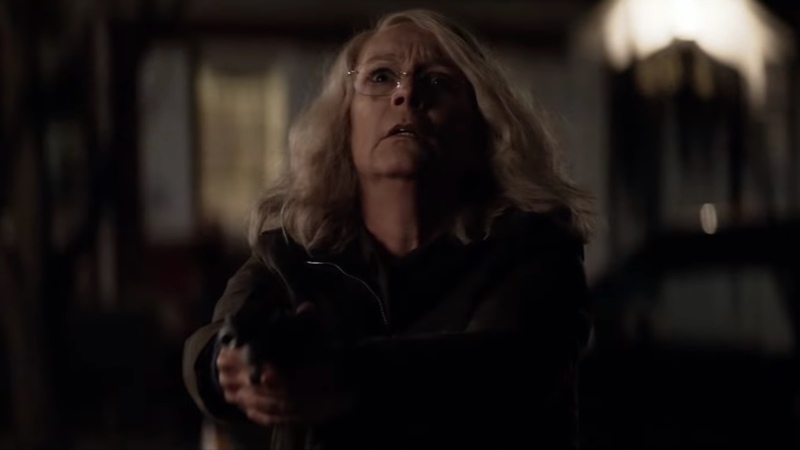 Halloween (2018) is no exception, regardless of box office numbers or critic opinions; the entertainment this film brings is solely based on nostalgia and a couple key components which, when set to the side with a discerning eye, reveal a foundation that’s always been crumbling away. It’s been years since Michael’s last attack, but Laurie is always at the ready, preparing her house like a doomsday shelter in case he were to ever come back to town. In theory he can’t, he’s locked away for life, but a transfer to a new location might be the chance he needs to escape and continue his deadly work. 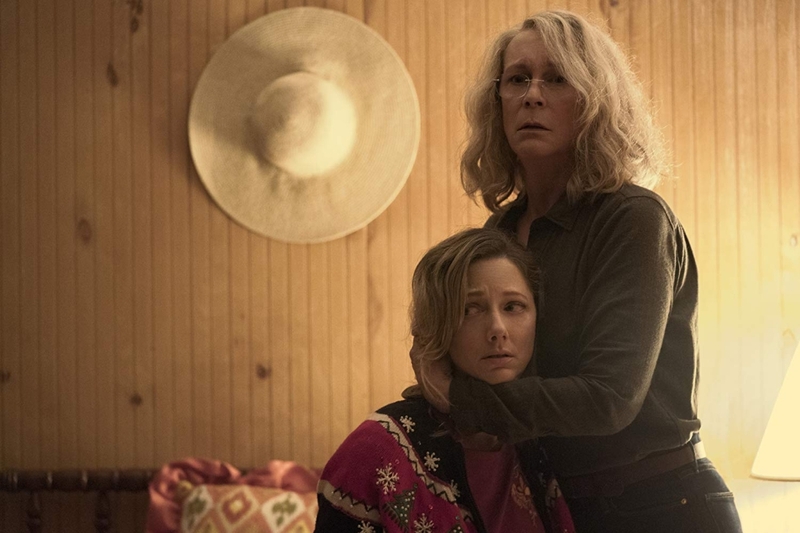 Laurie’s daughter Karen could never stomach her mother’s paranoia, became a therapist instead, and distanced herself from an aging woman who appears to be losing her mind. Laurie’s granddaughter. Allyson still wants a family connection, but she doesn’t believe in the threat that looms, can’t imagine what living through that horror might be like. But Halloween night is approaching, and Michael will soon be free, coming back to Haddonfield to finish the job he started all those year ago. I’ll start with the positives, because, before fans of the flicks run me out of town, there are many within this movie and within the series. I enjoy this pillar of a franchise as much as the next person, I’ve seen my fair share, grew up watching them on TV, and I understand their inherent worth, what they’ve given us in terms of pure terror. And this newest edition brings back a little of the former glory, giving us a taste of 1978 in a way that none of the sequels could ever really muster. The music and the murders are all you probably came to see and care to see, and you won’t leave disappointed; those are the strongest elements by far. A strong beginning, that theme song, some gruesome deaths; audiences get what they paid for, and in terms of scares and gross outs no one is left short changed. If that’s all you came to see, try to ignore a lot of the rest, focus on the fright, and you’ll go home happy. It’s the other 75% that fails, the meat of the movie that spoils, and I personally couldn’t ignore the details enough to fully enjoy the fun, which is why I can’t stamp this movie with a seal of approval. For disclosure; I don’t love the original or the franchise, I find it fine but not impressive, perhaps I didn’t watch it early enough to have it fully imprinted on my young mind. And so I can’t get past the film aspects to focus solely on the movie parts, can’t ignore the creation to find pleasure in the destruction, if you will. The biggest problem is the acting; it’s simply horrendous. I know horror movies aren’t known for their chops, but Jamie Lee Curits was so bad it was distracting, so mind-numbingly awful that it made you question whether your memory of her as a professional actress was all a dream. It’s unforgivable, and no one else helps out either, the rest of the cast feeling like people grabbed off the streets. The editing is amateur, the pacing is a problem, the ending is stupid, and I refuse to bow down to what should be a collective legend if what they offer me is crap. There is fun to be had if you want to pretend the periphery doesn’t exist, but you’re going to have to put in some work to make that happen, and I’m just not sure it’s worth it.